This is a great topic. Every year people waste tons of produce (and tons of dollars) throwing out poorly frozen fruits and vegetables. Here’s a big part of the problem: A lot of people believe that freezer bags and containers are the perfct solution for freezing foods, but the truth is they don’t seal completely – and this allows the passage of air (and moisture) to creep in and ruin your frozen fruits, vegetables, meats, etc. I can’t tell you how many times I’ve put liquids in a freezer bag or container and then had it start leaking, or else I’ve pushed all the air out of a bag just to watch it slowly fill back up. This happens because freezer bags and containers are not completely airtight. When added to the fact that everyday home freezers are terribly inefficient, you’ve got a recipe for disaster when it comes to freezing food. The other problem with learning how to freeze vegetables is usually your freezer. Home freezers rise and fall in temperature a lot more than you think, causing frozen foods to melt and gather condensation before freezing again. This wonky behavior is a serious problem when it comes to freshness. 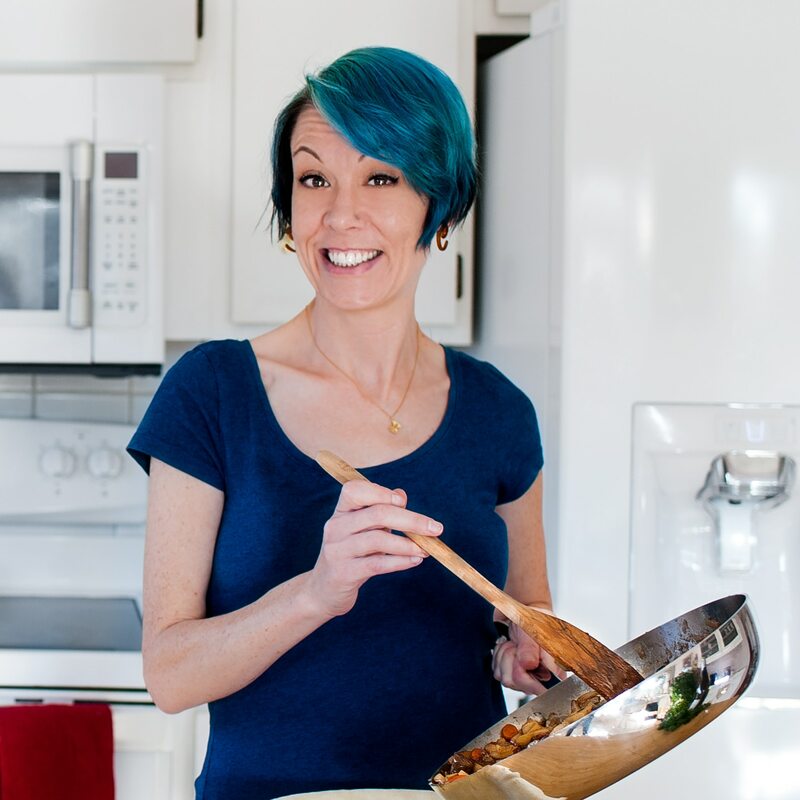 What’s a savvy home cook to do when deciding how to freeze vegetables, fruits, and other foods? You have two options: either double-wrap them in plastic wrap before putting them in a freezer bag, or invest in a vacuum sealer. If I know I’m only freezing vegetables or fruit for a few weeks, I don’t bother taking extra precautions. I just throw them in a zip-top bag because they will be eaten before freshness becomes an issue. But if I know something will be in the freezer for a month or longer – such as when life gets busy and things sit my freezer until the next ice age – I make a little more effort. The easy way to freeze vegetables and fruit (and pretty much anything else) is to wrap it tightly in plastic first, then place it in sealed bag or container. For meat, which is particularly sensitive to freezer burn, I wrap it twice before placing it in a zip-top bag. PRO-TIP #1: Then, there’s the super-duper kitchen gadget option: the vacuum sealer. This little toy can help a lot, because it seriously limits the air and moisture that comes in contact with your food. While these bad boys can be pricy, if you find yourself freezing a lot of food in an effort to eat healthy on a budget, a vacuum sealer is a wise investment. Freezer burn doesn’t really affect nutritional value, but it definitely changes the flavor and texture of your fruits, vegetables, meats, and anything else you’re freezing. Have you ever eaten something out of the freezer and noticed that stale freezer taste and smell? This happens most often with high-fat foods, such as ice cream, baked goods, and meats. Or have you defrosted something only to find it’s turned into a dried, shriveled fossil? That’s certainly not good eats. Again, the best way to avoid this is to make sure your frozen vegetables and fruits are well-wrapped and protected from exposure to air and moisture. When it comes to freezing fruit, there’s not much you can do about mushiness once you defrost them. This is caused by the water in the fruit’s cells expanding when they freeze, which causes the fragile cell walls to burst. When you defrost fruit, the water is no longer held in the cellular walls, so they become mushy. Fruits and vegetables that are very soft and high in water content tend to have more problems in this area, such as berries, apples, peaches, and the like. Hardy vegetables, on the other hand, stand up to freezing a little better because they tend to have lower water content. While they do still change in texture, stiffer vegetables like broccoli, cauliflower, carrots, and winter squash stand up to freezing pretty well (though they do still get a little softer once you defrost them – there’s no way around that). Tender veggies, such as zucchini and cucumber, often turn to sludge once frozen. You can still freeze them, but the texture will change once you’ve defrosted them. It’s just the nature of the beast. Some veggies keep well in the fridge for quite a while if you know how to store them properly. Here’s a few tips on the best way to store celery, and advice for keeping carrots fresher longer in the refrigerator. PRO TIP #2: If you really want to get all ninja-like on learning how to freeze vegetables, you can shock or blanch them before freezing. Blanching helps preserve flavor and texture and works best with harder vegetables. The method is simple: you basically drop them into boiling water for 1 or 2 minutes, just until they turn bright green, then immediately drop them in ice water to stop the cooking. Allow them to dry completely before freezing. The bonus is that they’re already partially cooked when you defrost them, so they take less time to cook. W00t! 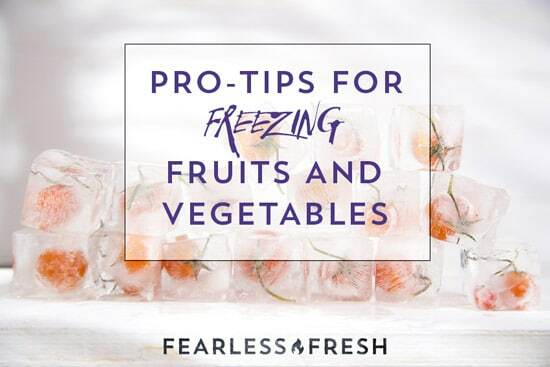 How long can you freeze veggies and fruits? Finally, some good news! Fruits and vegetables can be frozen for a pretty long time if they’re properly cared for. You generally want to use them within three or four months, but if you’ve wrapped your frozen fruits and vegetables tightly, they can last far longer. When they’re properly sealed and my freezer isn’t being bipolar, I’ve had frozen fruit last up to a year – though I’d recommend eating them far sooner to ensure the best flavor. Do you ever pull your veggies or fruit out of the freezer and find them stuck together in a huge block, so you have to hack off chunks with a steak knife? Yeah, that’s a bummer. I’ve learned a simple little trick that prevents the infamous “block-o-berries” problem. This is SUPER handy when you’re freezing large amounts of food that you’ll use slowly over time. Put the baking sheet into the freezer for a few hours, until your food has frozen solid. Remove the frozen produce from the parchment (which you can reuse for more of the same), break up any clumps, and toss them in a well-sealed bag. Now you can grab just a handful of whatever you need without defrosting the whole lot or going at it with a pick axe. This also works for cuts of meat, which tend to fuse together in the freezer and there’s no getting them apart without defrosting them. To do for you: This week, your homework is pretty simple: Go through your freezer and clean house. If you’ve got food in there that’s been hunkering down since the Reagan Administration, it’s probably best to toss it – along with any bags or boxes of unidentifiable freezer sludge. Then label whatever’s left and get to eating! Rotate any older foods to the front of your freezer and make a list of what’s there so you can use it in your meal planning. You might be surprised how much money you can save when you decide to eat down the contents of your freezer. So, now that I’ve covered a ton of information about freezing vegetables and fruit, it’s your turn. What did I leave out? Do you have any questions about freezing food?